I Gantt Get Enough of Lists! Last year I took some time to reflect on my goals for 2013. I also shared some tips for Organizing Your Small Business. Despite my efforts toward an organized life, I feel that 2014 has pushed me a bit off-balance. Part of that may be due to snow days. Part of it may be due to the concerns I have about my kids, guiding them in the next phase of their lives. I have two kids graduating this year and despite their amazing efforts at planning the next phase, it still requires my time and energy. reach out to a family from Sandy Hook, CT. I have seen a pillowcase drive, but I would love to create memory items for a family affected by this tragedy. I did well on the first half of my Maiden Jane list. I still do not know how to use Photoshop. I am working to manage my social media time. I would love to take a class on photography! Looking at numbers, I more than doubled my sales. I worked very hard – all the way up to the Christmas holiday – to meet deadlines. My personal sewing list was pushed down on the priorities, but I did make myself a beach blanket. I also donated two quilts and ran four 5Ks. So all-in-all, it was a wonderful year on the business and personal fronts. I have not articulated my goals for 2014 – perhaps because I am uncertain about them! I know that my quilt blankets will keep me very busy. And I have some collaborations that I am working on. I am still hoping to update my website. I don’t think I can double my sales again, as I am a one-woman sewing studio! I want to share with you a new Gantt chart that I am using to organize my custom projects. 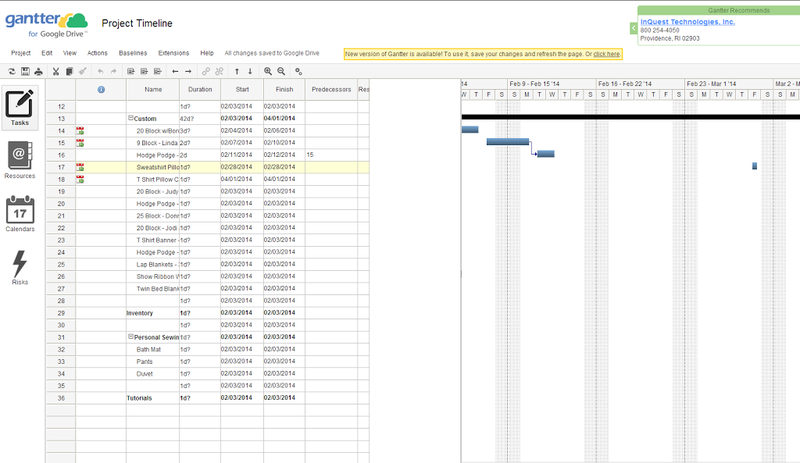 Last year I shared a post about Gantt charts. With most of my business being custom sewing, it is imperative that I stay on top of deadlines. I downloaded a template and used it to store all of the project details and contact information as well as the timelines. However, I found the file large and when I printed it out – too small. I need to look at the list frequently and I need strong visual cues to keep me on track. I explored two online charts. The first is Gantter. It is an online timeline. It is fairly easy to use but I wasn’t sure how to customize the columns. I also looked at Asana. I settled on Tom’s Planner. An example of my page is shown at the top of this post. It’s free and I can use it across all my devices. There are upgrades available, but they really aren’t necessary for my small business. 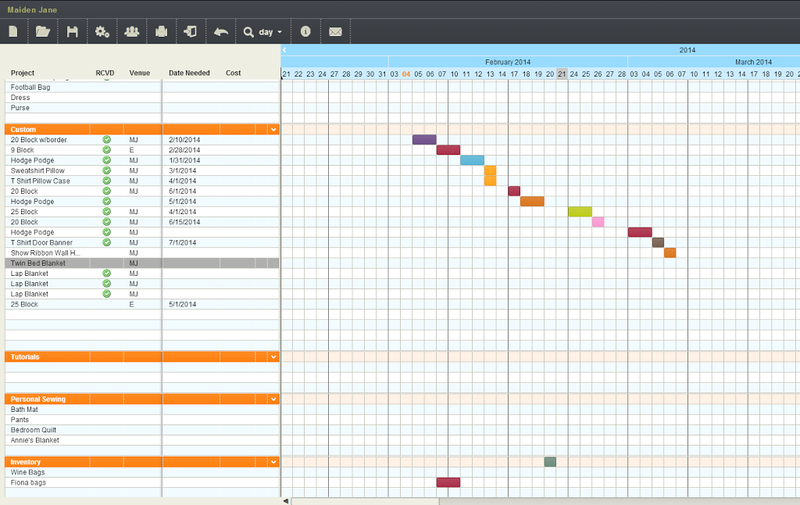 Gantt charts are useful for large projects with linked tasks and multiple collaborators. I don’t need that level of detail. For me, I just need a simple timeline. I like that I can simply add rows and columns and that the timeline is easy to use. I also added several categories so that I can budget time to build inventory or do some personal sewing. I am still using Google Calendar and have created a business calendar, but I don’t use that as much. There is an interesting post here that tells you how to use your Google Calendar for project management. Seeing my projects in a timeline seems to work best for me. I put tasks on my Google Calendar that fall into the “to do” type lists. But I also use Wunderlist. I keep all manners of lists on there that run around in my head: household projects, tutorial ideas, business lists, supplies I need to buy. Anytime I run out of a sewing supply, I add it to the list. Then I take my Ipod with me to the store and have the list ready for me. I love that I can add photos now, which is helpful for matching fabric. Wunderlist is very easy to use. If they eventually add a timeline capability, then I would consider using it for my project list as well. I never quite understood Evernote. I have tried it several times and sometimes I will save an article to it, but I just cannot master it. What productivity tools and apps do you like to use? Although you haven’t inspired me to make color charts yet, I think your goal lists are awesome. I have goals, but not in writing. I think I will do it today. As for photoshop, I use it to alter photo’s. Poppy always has me make her thinner. It’s also great for banners. picmonkey.com is a great editor too. I’m pretty good at photoshop, but I’d have to teach you in person. Maybe you can stop by here some nice spring day.